B C Hucks flew from Mansfield to Brampton, sponsored by 'The Daily Mail' newspaper. Photographed in the Terminus Hotel Grounds with boy scouts in attendance. Bentfield Charles Hucks (1884-1918) was born at Stanstead in Essex, the youngest son of a consulting engineer. 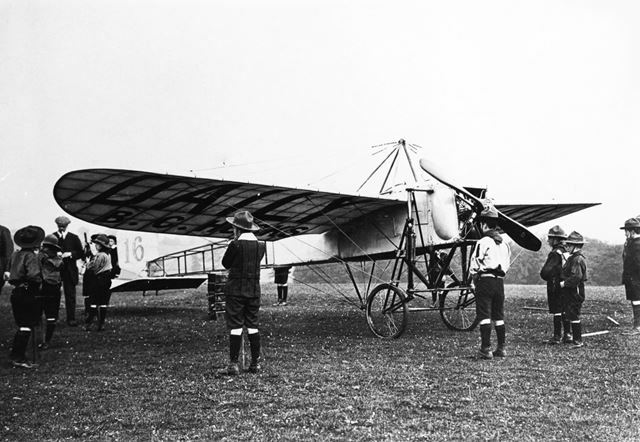 An interest in motor cars led to one in the new science of flight, something he was actively involved in from 1910. Over the next few years he was very active demonstrating the merits of flying before volunteering for active service when war broke out in 1914. Unfortunately ill-health (pleurisy) curtailed his aerial fighting with the Royal Flying Corps but he then did duty as a test pilot with the Aircraft Manufacturing Company. His death in November 1918, only days before the end of hostilities, was due to the then pandemic of Spanish Influenza followed by pneumonia. His obituary in 'Flight Magazine' included the following: 'In the autumn of 1911 he gave a most successful series of exhibitions in the West of England, and from that date down to the outbreak of war he rendered magnificent service to British aviation by the remarkable demonstrations of the progress of this science which he gave in almost every part of the country. It is probably no exaggeration to say his name will be remembered by hundreds of thousands of people who, through him, saw flying for the first time in their lives, and thus realised it had become an accomplished fact and not a mere dangerous experiment. This educational work has perhaps never been fully appreciated as it deserves'.